Located in the ranch museum is a research library that was established in 2008, a unique gift from the private collection of Mr. and Mrs. Leland Wilson. After numerous visits to the Will Rogers estate in California, Mr. Wilson endowed his collection to support the mission of this historic park: to provide opportunities for understanding Will Rogers’ contributions to American history, folk life, and the national character. The Wilson collection holds over 1,900 books and related materials, some rare, many out of print, the subject of all: Will Rogers, his interests, contemporaries, and the era in which he lived. Leland Wilson was born in Tonkawa, Oklahoma, in 1930, and was raised on a farm five miles east of Aline. He attended Round Grove grade school, a one room, one teacher school, and Aline High School. Wilson’s interest in Will Rogers deepened when he took a Freshman English class at George Washington University in Washington, D.C. in which he wrote a report on Will Rogers. By his mid-twenties, he was collecting Rogers’ materials, especially books! Professionally, Wilson served the Church of the Brethren pastorates in numerous states and at the General Offices in Elgin, Illinois, and Washington, D.C. He married native Californian Patricia Botterell. Even with a career and five children he managed his collection shopping in bookstores from Manhattan to Ecuador! Will Rogers didn’t pick his biographer, but there can be no doubt about his place in American history through the “truths” held in the abundance of stories found in the Wilson collection that serve as place markers that remind us to pause and remember a life well lived. From books to postage stamps, larger than life statues, airports, a hospital, marine vessel, schools, foundations, streets, and of course parks across the United States, Will Rogers is commemorated for his integrity, ingenuity, candor, and humanity. Trot out the Polo Ponies! Polo season is here and the teams of polo players on galloping ponies are here to win the trophy! For all to view, we have assembled a unique display of Will Rogers’ polo trophies and sports memorabilia in the historic ranch house museum. When Rogers purchased his Santa Monica Canyon property, one of the first landscape features he built (after grading roads that would wind 250 ft. up the steep canyon) was the polo field. For a western ranch, a polo field could be considered an unusual feature. Not so, if you were Will Rogers! The avid horse man lived in New York at the height of the sport’s popularity in the United States. Rogers liked the athleticism of the game – it is rugged, fast moving and requires good horsemanship skills. In the October 26, 1930 edition of his weekly article entitled "Trot out the Polo Pony," among other erudite comments Rogers made about polo, horses, and economics, he affectionately stated "It’s a great game, and it learns you how to ride quicker than anything on earth… Age don’t keep you from playing it. I am going to play til my whiskers get tangled up in the horse’s tail." He was often seen wearing western blue jeans and an old white sweatshirt when playing, rather than the customary britches. Rogers’ matches at the ranch have been attributed to increasing the popularity of the sport on the West Coast, attracting Hollywood executives, movie stars, and top notch polo players. Studio executives Darryl Zanuck, Hal Roach, and Walt Disney, actors Spencer Tracey, Carol Lombard, polo celebrities Snowy Bake, Winslow B. Felix, and even an Olympic Team played on the field. Will Rogers' grass field was the first in Rustic Canyon and today is the last remaining in Los Angeles County. Make sure you visit the exhibit before or after the live action of the games! The exhibit includes: trophies, mallets, ball retriever, practice mallet, polo hat and britches, etchings and books, a small sample of which is featured in the adjacent slideshow. 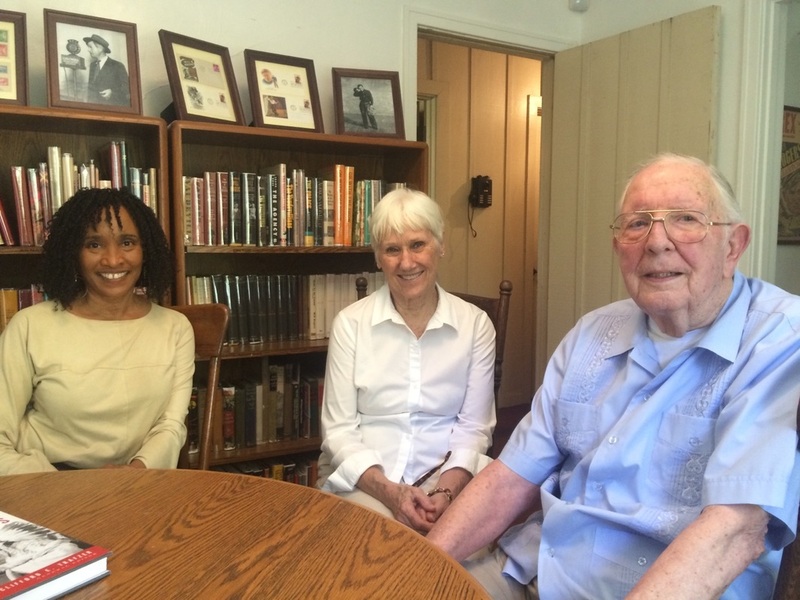 Ranch house lower level, North wing reading room - Leland Wilson, wife Patricia, and Rochelle Nicholas-Booth, Museum Curator delivering additional books to the library. Stampeding long horns in a haze of dust and grit, cowboys astride sprinting horses with all four hooves simultaneously in the air on the chase, the pause of a pastoral landscape of grazing cattle against endless blues skies, or the bell tower of a lone California mission on the horizon... Come see the works of western artist John Edward Borein (1872 -1945) in the intimacy of the historic Will Rogers ranch house. Borein’s etchings and watercolors, often only 7 by 12 inches, illustrate frame by frame in cinematic drama the vanishing cowboy tales of the Old Southwest. Like Will Rogers, Ed Borein grew up on a cattle ranch and became immersed in cowboy culture. While on the range he would sketch the adventures of his travels throughout California, Oregon, and Mexico. He also became adept at cowboy crafts such as lasso braiding, saddle making, and iron work. Rogers first met Ed in New York where he had a commercial art studio in the heart of the theater district. Serendipity would bring the two men together again in California –Rogers with a contract with Metro Goldwyn in the emerging film industry and Borein returning to his birthplace as an artist and illustrator for several Southwest magazines. The men remained lifelong friends. There are twenty-two etchings and eleven watercolors by John Edward Borein that are original to the Will Rogers ranch museum collection. Since 2003, Will Rogers State Historic Park has been a participant in the Getty’s Multicultural Undergraduate Internship Program that aims to encourage greater diversity in the museum profession. Working with curator Rochelle Nicholas-Booth, students engage in hands-on projects at the park that range from conducting surveys and inventories, packing and storing artifacts, to research on the museum collections and developing interpretive exhibits. Meet 2014 intern Laura Worden who is a student at Pepperdine University majoring in art history and studio art with plans to become a museum curator! She has been working with museum staff to photograph and digitize materials from our museum collection and archive to support our goals of providing virtual access to visitors online and onsite! So far, Laura has especially enjoyed reading the hand written inscriptions on the cover pages of the first edition books authored by an eclectic group of Will Rogers’ friends and contemporaries that include Harry Houdini, Theodore Roosevelt, Helen Keller, Eddie Cantor, William S. Hart, Chief Buffalo Child Long, Elizabeth Morrow and even Emily Post! The internship is a 10-week program.